KioWare for Windows version 8.14 offers a brand new Guided Setup and support for new devices such as printers, bill/coin acceptors, and more. 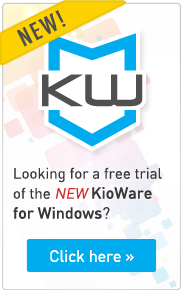 KioWare for Windows now includes a Guided Setup to make it easier to start your kiosk project. Version 8.14 of KioWare for Windows is now available with a brand new Guided Setup allowing customers to quickly and easily set up KioWare for Windows to display interactive and non-interactive digital signage, play videos, and utilize KioCall video conferencing. With this new Guided Setup, KioWare can be configured to secure a Windows device into a kiosk with only a few clicks. New, supported devices have also been added. Analytical Design Solutions Inc. (ADSI) has released a new version of KioWare for Windows kiosk software with an all-new Guided Setup wizard to help first time users configure KioWare for Windows. In addition to the new Guided Setup tool, version 8.14 of KioWare for Windows (Lite, Basic, & Full with Kiosk Management) has added support for Chrome 65. KioWare Basic & KioWare Full for Windows now support devices such as the Stimare printer (supporting printing to RFID bracelets), Star printers, Telequip (coin dispenser), Epson receipt printers, and adds support for ccTalk for bill/coin acceptors. View all supported devices here. The new Guided Setup provides users with the option to easily configure KioWare for Windows to show interactive content (browser-based), non-interactive digital signage, and as a video conferencing kiosk using the KioCall Videoconferencing app. Additional settings can also be configured by answering questions and progressing through the Guided Setup. As always, users can opt to exit the Guided Setup and configure KioWare directly through the configuration tool at any time. These products are available as a free trial with nag screen. Existing clients can upgrade at https://www.kioware.com/downloadupgrade.aspx.